His on-screen alter-ego may not be saying much these days, but Hafþór Júlíus Björnsson—a.k.a Game of Thrones’ Mountain—had plenty to yell about this past month. 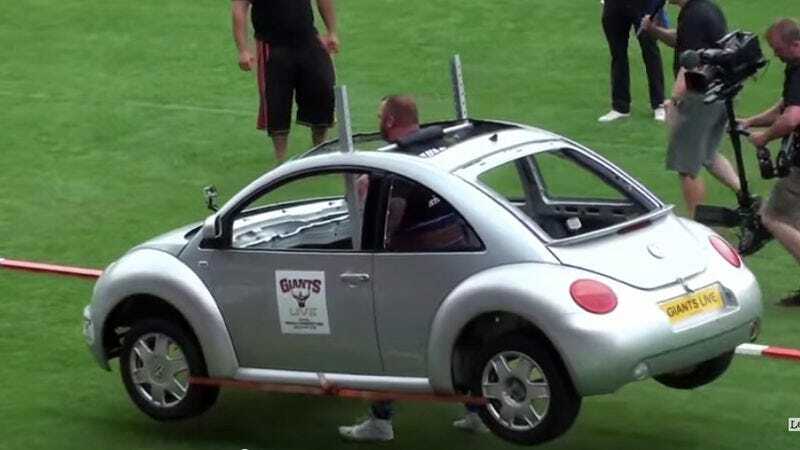 The actor and full-time walking advertisement for gym memberships once again won Europe’s Strongest Man competition, the second year in a row he’s achieved that prize. Sure, it’s no thousand-year-old strength record, but it’ll do for now. As you can see in the highlights reel below, Björnsson performed a number of feats of strength to claim the top spot, any one of which on its own is enough to make us wonder where the time has gone, and what little use we’ve made of our lives. After the negligible achievement of lifting just shy of half a ton, he also carried a VW Bug on his shoulders, hoisted a tree trunk over his head multiple times, held a hammer roughly the same weight as your body with outstretched arms, and lifted giant round boulders onto barrels, because that’s an after-school chore with which we’re all familiar. Given that none of these performances resulted in breaking another world record, it was probably a distinctly underwhelming day for the guy.